Process Oriented Guided Inquiry Learning (POGIL) is a pedagogy that is based on research on how people learn and has been shown to lead to better student outcomes in many contexts and in a variety of academic disciplines. Beyond facilitating students’ mastery of a discipline, it promotes vital educational outcomes such as communication skills and critical thinking. Its active international community of practitioners provides accessible educational development and support for anyone developing related courses. Having started as a process developed by a group of chemistry professors focused on helping their students better grasp the concepts of general chemistry, The POGIL Project has grown into a dynamic organization of committed instructors who help each other transform classrooms and improve student success, develop curricular materials to assist this process, conduct research expanding what is known about learning and teaching, and provide professional development and collegiality from elementary teachers to college professors. As a pedagogy it has been shown to be effective in a variety of content areas and at different educational levels. This is an introduction to the process and the community. Every POGIL classroom is different and is a reflection of the uniqueness of the particular context – the institution, department, physical space, student body, and instructor – but follows a common structure in which students work cooperatively in self-managed small groups of three or four. The group work is focused on activities that are carefully designed and scaffolded to enable students to develop important concepts or to deepen and refine their understanding of those ideas or concepts for themselves, based entirely on data provided in class, not on prior reading of the textbook or other introduction to the topic. The learning environment is structured to support the development of process skills –– such as teamwork, effective communication, information processing, problem solving, and critical thinking. The instructor’s role is to facilitate the development of student concepts and process skills, not to simply deliver content to the students. The first part of this book introduces the theoretical and philosophical foundations of POGIL pedagogy and summarizes the literature demonstrating its efficacy. 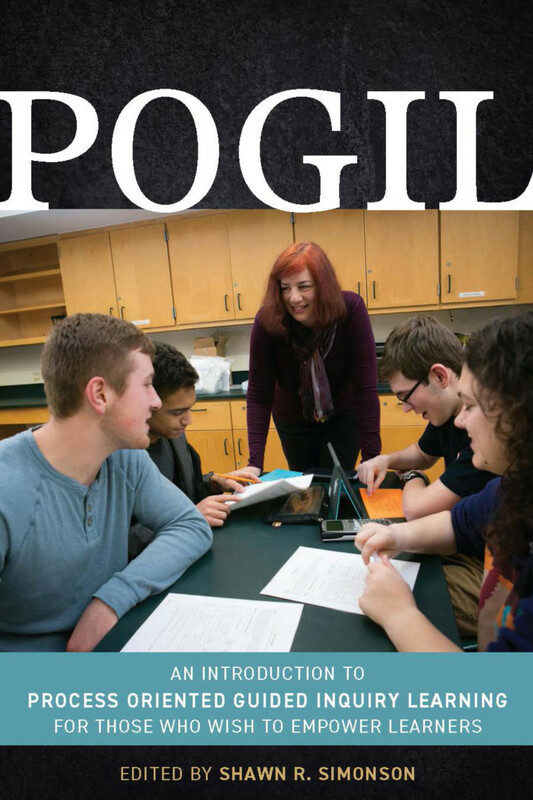 The second part of the book focusses on implementing POGIL, covering the formation and effective management of student teams, offering guidance on the selection and writing of POGIL activities, as well as on facilitation, teaching large classes, and assessment. The book concludes with examples of implementation in STEM and non-STEM disciplines as well as guidance on how to get started. Appendices provide additional resources and information about The POGIL Project. "This collected wisdom of the POGIL community is immense, reflecting both practical classroom strategies and strong ties to theoretical frameworks in science education, sociology, and the learning sciences. With origins in undergraduate chemistry education, the ideas contained in this guide are relevant to any instructor – in any discipline and at any cognitive level – who aspires to structure an engaging and equitable classroom environment that also challenges students to be architects of their own learning." “A timely, comprehensive, and highly informative must-read for anyone interested in implementing active learning in their science, engineering, or mathematics undergraduate classrooms." Shawn R. Simonson is Director of the Human Performance Laboratory, Professor in the Department of Kinesiology, and Faculty Associate in Center for Teaching and Learning, at Boise State University. Dr. Simonson uses a variety of learner-centered pedagogies as he works to help students become independent learners. He has published in teaching and learning, exercise physiology, and environmental physiology.